Is there a doctor in the house? If the Huawei Mate 20 Pro is in your hand, then the answer is yes. 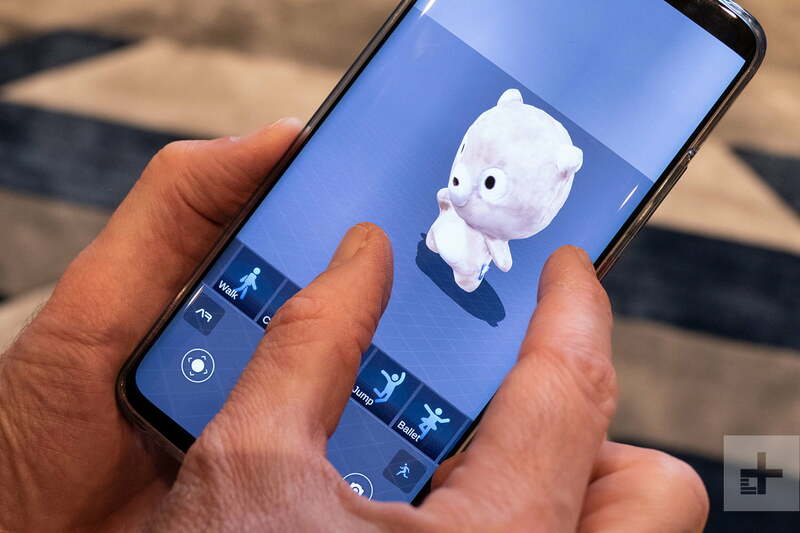 With this powerful phone, you can make your favorite toy come alive in front of your eyes, using augmented reality and a special 3D Live Maker app. Prepare to shout, “It’s alive!” a lot, as we take you through how to use it. 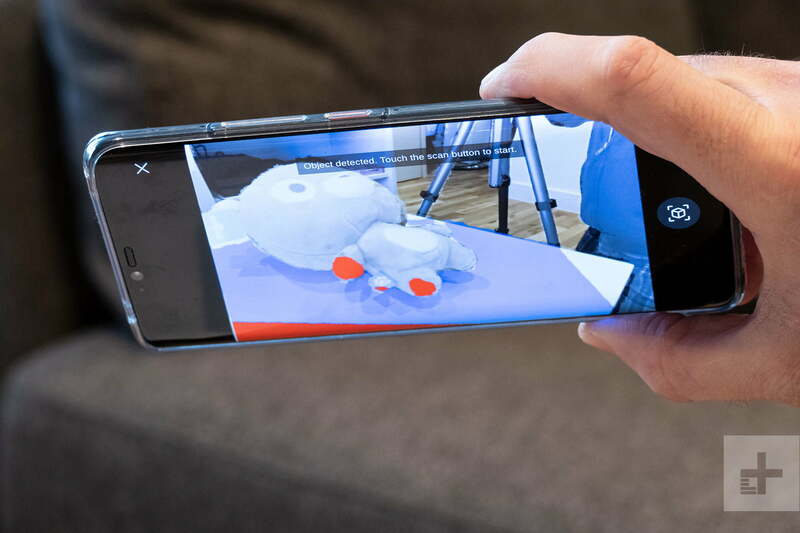 The 3D Live Maker app does not come pre-installed on the Mate 20 Pro. Instead, you must either download it from Google Play, or from Huawei’s own App Gallery app. It currently only works on the Huawei Mate 20 Pro, the almost identical Porsche Design Mate 20 RS, and in the future the Honor View 20, because it requires the use of artificial intelligence chips like the Kirin 980, plus suitable 3D sensors and cameras. The first thing to do is select the right object to scan. The app says not to pick something that’s reflective, or made from metal, and says plush toys work best. When you do pick a plush toy, it should be something between 12cm and 35cm long. Based on our experience, it shouldn’t be too complicated-looking either. A simple teddy bear-shaped toy is ideal here, as anything with clothing or accessories confuses the process. In case you’re interested, we use DU Bear in our video, the mascot for the Baidu search engine. 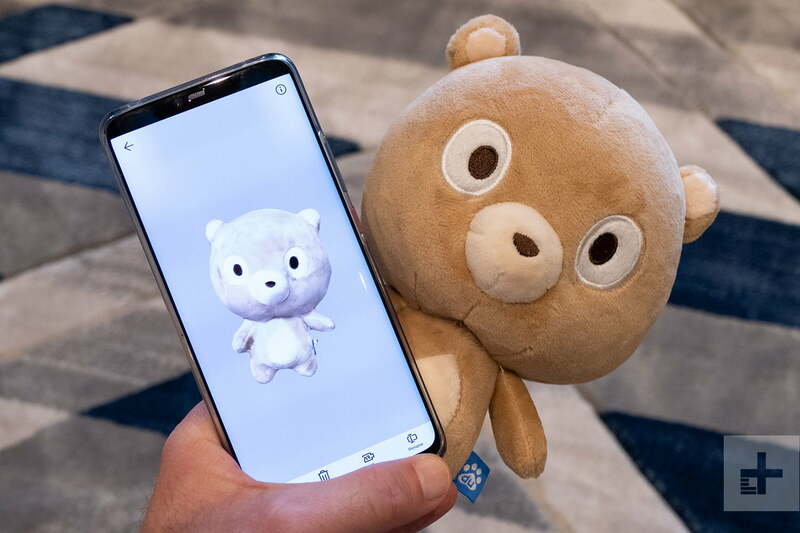 Even here, the short legs and big head still cause problems for the app, which struggles to understand Du Bear does not have much of a body, and as a result the animation isn’t perfect. Open the app, and tap the Plus icon in the bottom right of the screen. 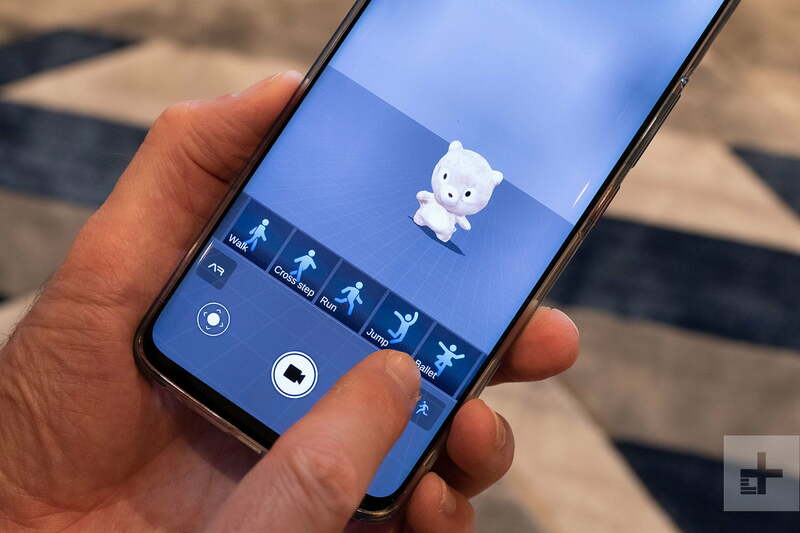 The app uses the front camera on the Mate 20 Pro — because this has the 3D sensor technology — and therefore you have to hold the phone rather awkwardly, because you need to see the screen during the scan. 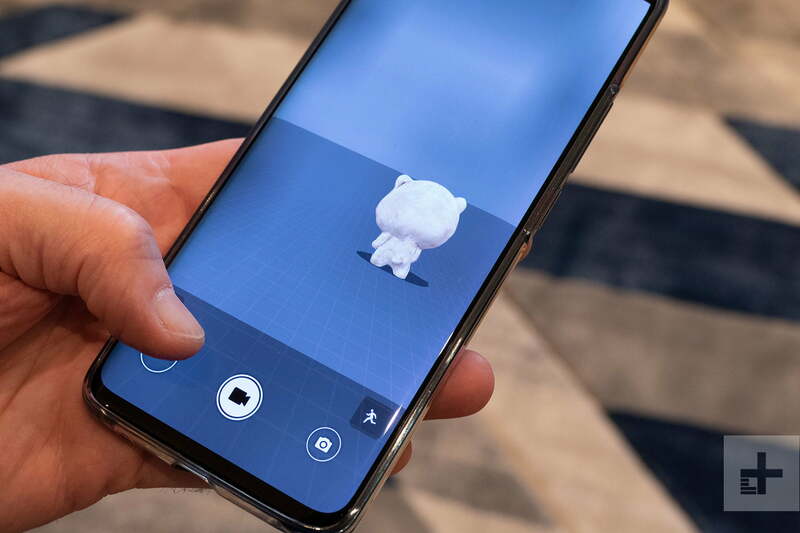 You have to hold the phone at a 45-degree angle to the object, not too far away, and wait until the camera identifies there is an object to scan. This needs some patience, and it absolutely needs the right item. You find out quickly if the object you’ve chosen isn’t suitable, because the camera will fail to recognize it. When it does, a blue square appears under the object. Now, tap the Scan button on the screen to move on to the next stage. A progress bar appears at the top of the screen. To scan the object in, you have to rotate the object so the camera can see the entire shape. The blue colors disappear as it’s recognized, the shading looks more like real-life, and the progress bar fills. If you’re trying to scan something too complicated, this is very time-consuming, and you will get errors. If the object moves out of the camera’s view, it asks you to bring it back into focus by matching it up with a “ghost” on the screen. The more complex the item is, the longer this takes, and the more errors you get. We highly recommend picking something simple. Our DU Bear took just a few minutes to scan. When the progress bar is full, you must manually stop the scan by pressing the Scan button again. The app now begins to build the 3D model. When it has finished, just tap the tick icon in the top corner of the screen. On the main screen of the app, tap the model you’ve just scanned in. The app can hold multiple scans of multiple toys. It will appear on screen and can be rotated and zoomed in to examine. Along the bottom of the screen are several options including share and delete, but we want to choose the one marked AR, for augmented reality. The next screen needs you to manipulate the model so it’s facing the right way up and towards the camera, in portrait orientation. Tap next when you’re done, and the model will appear on the phone’s screen. In the bottom left is a virtual joystick for moving the model around the screen, along with a video record and a still photo button. However, we recommend tapping the AR button. Now, point the camera at a flat surface — a table works best, but you can use the floor too — and let the phone recognize the space, indicated by a small progress circle on screen. When it’s done, the model will appear on it. Tap the button with the running man icon to find different auto controls like jump or ballet, or move the model around yourself with the virtual joystick. Again, you can record these activities using the on-screen controls. Yes, it does, but don’t expect it to always look amazing, or do anything much outside of move around a bit. This isn’t a dig at the 3D Live Maker app, which is user-friendly and fast, but augmented reality technology generally is still a bit wonky. It’s fun to find a model and scan it in, then watch it wander around for a while. Once that’s done, there isn’t anything else to do. In the future this will change, and scanned in models could be used as avatars in games, and potentially for virtual assistants too. 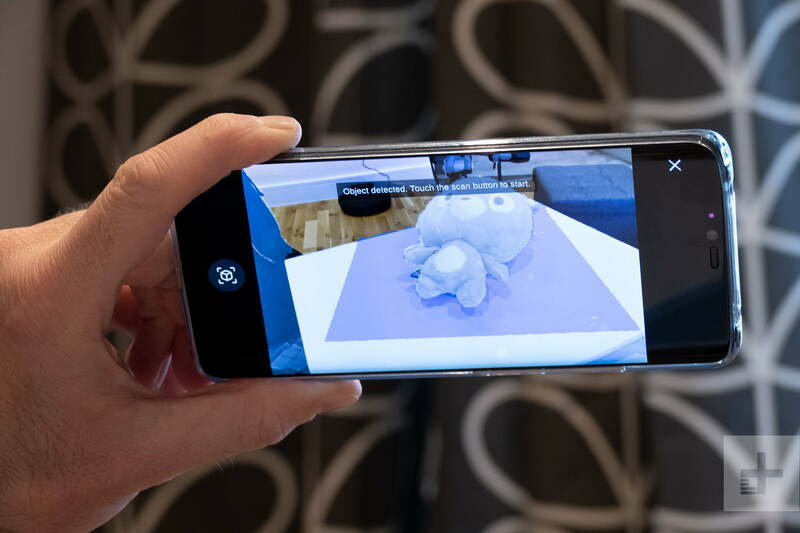 For now, 3D Live Maker is a fun app that will engage kids for a little while, and amuse adults who want to see what augmented reality is all about.